Shown here after a successful emergency landing on July 24, 1983, this Air Canada Boeing 767 went into the history books for the incredible airmanship of its crew, who pulled off the longest unpowered flight by a jet airliner. Due to a mixup with metric measurements, the big Boeing carried less than half the required fuel load when it took off for Edmonton, Alberta. At 41,000 feet of altitude over Thunder Bay, Ontario, power to both engines was lost and the pilots determined that they could make it to the former RCAF station at Gimli, Manitoba, which had been decommissioned in 1971. Since decommissioning, Gimli had been converted to a multi-use motor racing facility. In addition to a road circuit, the airport runway was converted into a dragstrip with steel barriers running partially down the length of it, presenting a potentially lethal obstacle to the crew as they glided virtually silently down to the tarmac, fully committed with no ability to abort the landing. While the main landing-gear wheels came down and locked into place properly via gravity, the nose wheels would not lock during the approach. The plane's Captain, who flew a sailplane in his spare time, and the Co-Pilot, who had flown out of Gimli some years earlier as a military pilot, made a safe unpowered, dead-stick landing following a massive sideslip maneuver. Once the nose settled, the unlocked nose gear collapsed and the 767 lurched to a stop on its nose and main wheels. And all 69 on board (61 passengers, 8 crew) survived. A few passengers received minor injuries while exiting the aircraft via the rear escape chutes. All this unfolded while a race was in progress on the decommissioned runway! 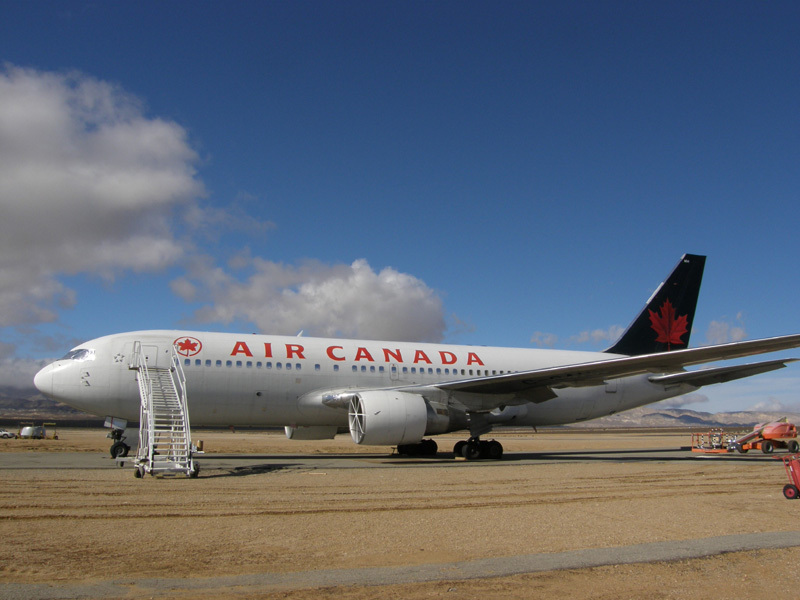 The "Gimli Glider" photographed by Alan Radecki following arrival in Mojave following her 2008 retirement. The "Gimli Ghost" was repaired and flown out just two days later. She flew another 25 years for Air Canada. Following her retirement in 2008, the 767 made her final flight to a storage facility in Mohave, California. Her two pilots from that harrowing day in 1983 were on board, along with several of the cabin crew. When she departed her Montreal, Quebec base, the 767 made a low pass over the runway, waggled her wings, and headed off to Mojave. Now, she is being offered for sale via video presentation at the Toronto International Classic Car Auction on Sunday, April 14. The auction is the oldest and largest event of its kind in Canada and it is presented by Dan Spendick's Collector Car Productions. For more images and details, see www.ccpauctions.com.